Practical advice for attracting fabulous men! Forget the ‘rules’ of dating –these flirting ‘tools’ will move you in the right direction and knock down what’s blocking your path to finding that great guy. Fun, quirky hints, thought-provoking exercises and flirting tips show you not only how to get that guy - but how to do it with style! 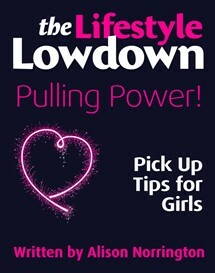 It’s no secret that men approach dating and relationships completely differently from women and while ‘Pulling Power: Pick Up Tips for Girls’ may not help you to understand men completely, it can give you tips and insights to help you harness your pulling power to attract the kind of men you’d love to be with!